A VERY LARGE ISLAMIC CANDLESTICK PROBABLY ORIGINALLY FOR A MOSQUE. THE CANDLESTICK IS CAST BRASS. IT HAS FOUR DIFFERENT ISLAMIC MARKINGS INSET INTO ROUND PANELS. THE CANDLESTICK IS VERY TALL AND VERY HEAVY. THIS IS OLD SO IT HAS WEAR AND MARKS. PLEASE SEE THE MANY PICTURES BELOW. 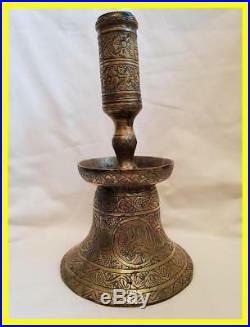 The item "ISLAMIC EARLY 19TH CENTURY BRASS VERY LARGE BELL CANDLESTICK- MOSQUE-28CM TALL" is in sale since Thursday, November 1, 2018. This item is in the category "Antiques\Asian/Oriental Antiques\Islamic/Middle Eastern". The seller is "phil3115" and is located in norwich, Norfolk. This item can be shipped worldwide.